It's one of the frustrating ironies of modern vaccination campaigns. When widespread immunization works as intended, people tend to forget the trauma of infectious diseases. Long gone are the days when parents saw neighborhood kids paralyzed by polio or left with hearing loss or brain damage—if they survived—after contracting rubella, Hib meningitis or measles. When memories of the suffering wrought by vaccine-preventable diseases fade, it’s easier to view vaccines as optional or to consider potentially life-threatening illnesses a childhood ritual. Vaccination programs have proven so successful against once-common diseases that even doctors sometimes lose sight of their value. A 2011 survey of 551 physicians found that although doctors generally support vaccination, younger doctors were more likely than their older counterparts to question the safety and effectiveness of vaccines. Saad Omer, an infectious disease epidemiologist at Emory Vaccine Center who led the study, suggested that some younger doctors’ perceptions of vaccines, like those of contemporary parents, are shaded by their inexperience with the diseases they target. Vaccines, public health officials often lament, have become victims of their own success. Still, maintaining that success requires constant vigilance. Whooping cough, one of the deadliest childhood diseases, has been increasing since the 1980s, with outbreaks peaking every three to five years. In 2010, the United States saw 27,550 pertussis cases, the most since 1959, when health officials logged 40,000 cases. Following the cyclical nature of the disease, incidence dropped the next year (with 18,719 cases reported) but then exploded to 41,000 in 2012, when 49 states reported disease spikes. More than 9,000 Californians caught pertussis during the 2010 epidemic. Ten infants died. The latest figures from state health officials are not encouraging. As of the end of June, the state had recorded 739 cases—likely an underestimate due to reporting delays—up from the same time last year. Several San Francisco Bay Area counties have reported spikes in pertussis in recent months, but Marin and Santa Clara reported more cases than any other county in the state. Tragically, the sporadic nature of these outbreaks—and that fact that epidemics affect tens of thousands rather than hundreds of thousands of people, thanks to vaccination—means that doctors who haven't treated vaccine-preventable diseases can miss their symptoms. Last May, a couple in Michigan lost their three-month-old daughter to whooping cough after four doctors failed to recognize it. When vaccine coverage is generally high, infectious disease outbreaks tend to cluster in unprotected pockets, where parents choose not to vaccinate their children. Health officials blame vaccine refusal for the measles outbreak in the United Kingdom this year and the largest measles outbreak in 15 years in the United States in 2011. But experts don't think vaccine refusal is driving recent pertussis epidemics, although children who failed to receive all their shots are at least eight times more likely to get the disease. And it turns out that Bordetella pertussis, the bacterium that causes pertussis, can persist even in the face of widespread vaccination. Experts think several factors may be at play. Vaccine-induced immunity to pertussis appears to weaken faster than expected. The vaccine might be targeting less prevalent strains of the bacterium. Or circulating strains could have adapted to the vaccine, allowing it to flourish even after vaccination. Though more infants contract pertussis—and die of it—than any other age group, anyone can contract, and transmit, the disease. But because pertussis tends to be milder in older children and adults, and can present with odd symptoms like disturbed sleep, sweats and sneezing attacks, it can be difficult to identify, even for doctors familiar with the disease. As a result, undiagnosed older children and adults can pose a serious threat to infants too young to have received all five recommended vaccine doses. (Experts recommend that children receive five shots of the DTaP vaccine, which inoculates against diphtheria, tetanus and pertussis, between the ages of two months and six years.) The Michigan mother who lost her baby girl to pertussis told an online news site that she may have unwittingly infected her daughter because she didn't know a booster shot could have protected her baby. 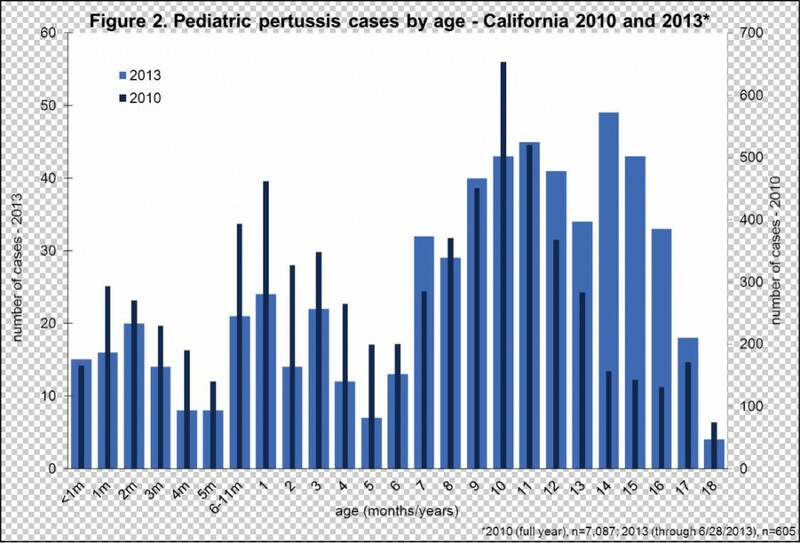 The good news is that pertussis rates in California are much lower than those seen during the 2010 epidemic and no deaths have been reported since then. Still, the disease hit more kids between the ages of 12 and 17 this year than during the 2010 epidemic, according to state health records. And that’s just reported cases. It’s impossible to know how many adolescents or adults with persistent coughs remain undiagnosed—placing their baby brothers, sisters or other susceptible people at risk. And we’re just at the beginning of the next three- to five-year peak, which is why state health officials continue to urge parents to vaccinate their children. But not all parents are heeding the call. The number of California kids going to kindergarten with all of their recommended vaccinations has been declining steadily since 2008--even for polio--state records show. That drop tracks another California trend: the percentage of parents securing a personal beliefs exemption has increased from 1.9% in the 2008-09 school year to 2.8% this year. That may explain why several Bay Area counties reported outbreaks in schools. 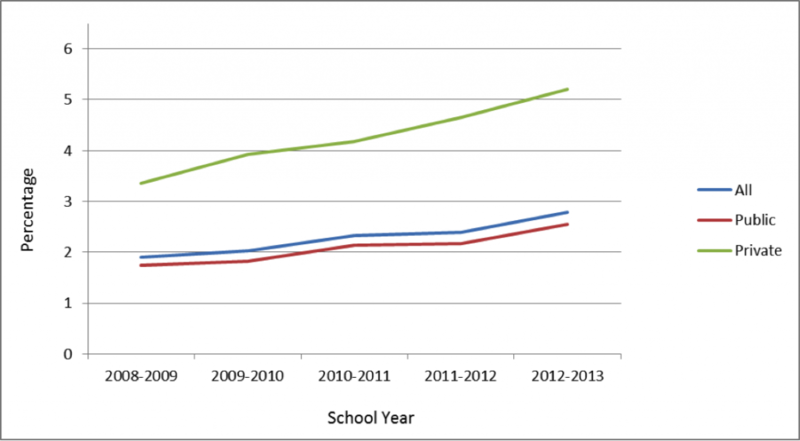 In keeping with past trends, parents who send their kids to private schools were more likely to opt out of vaccination. Starting January 2014 a personal beliefs exemption will require a health care provider’s signature, indicating that the parent understands the risks of refusing vaccination. The most recent state reports also show that vaccine coverage for pertussis among Bay Area kindergartners was generally high, except for Marin County, where just 86 percent of kids received their recommended shots. Marin has reported the second highest number of pertussis cases in the state this year, with 96. The only way to prevent pertussis and other infectious diseases is through vaccination. Those too young or sick to get vaccinated benefit from what’s called herd, or community, immunity, which requires a certain proportion of immunized people to stop the spread of disease from person to person. That threshold varies depending on how quickly a disease spreads. Pertussis has the highest threshold, requiring between 92 and 94 percent immunization to block transmission. The highly toxic, contagious and adaptable pertussis pathogen will easily exploit any holes in community immunity. No one can say for sure when the next epidemic might hit. But now’s the time to make sure your child is fully vaccinated. And if you spend time with young children, get a booster shot. I did. Vaccinate yourself. Protection after vaccination or infection wears off over time. Check with your doctor to see if you need a booster shot. Vaccinate your children. Young children need five doses of DTaP (PDF) by kindergarten (ages 4-6). Pregnant women should receive a Tdap booster during their third trimester of each pregnancy, even if they got it before pregnancy. Adults should also receive a Tdap booster, especially if they are in contact with infants or work in health care. Most adults have not yet received Tdap.